Home › Home and Kitchen › Freshware 15-Pack 3 Compartment Bento Lunch Boxes With Lids - Stackable Reusa..
Freshware 15-Pack 3 Compartment Bento Lunch Boxes With Lids - Stackable Reusa..
OP-NOTCH QUALITY: Made exclusively from FDA Approved and BPA Free materials, these lunch bento boxes are the best choice for you and your children. Unlike most poorly-made lunch boxes that give a strange taste and smell to your food, with Freshware meal prep containers make sure that your meal will stay fresh, delicious and healthy. 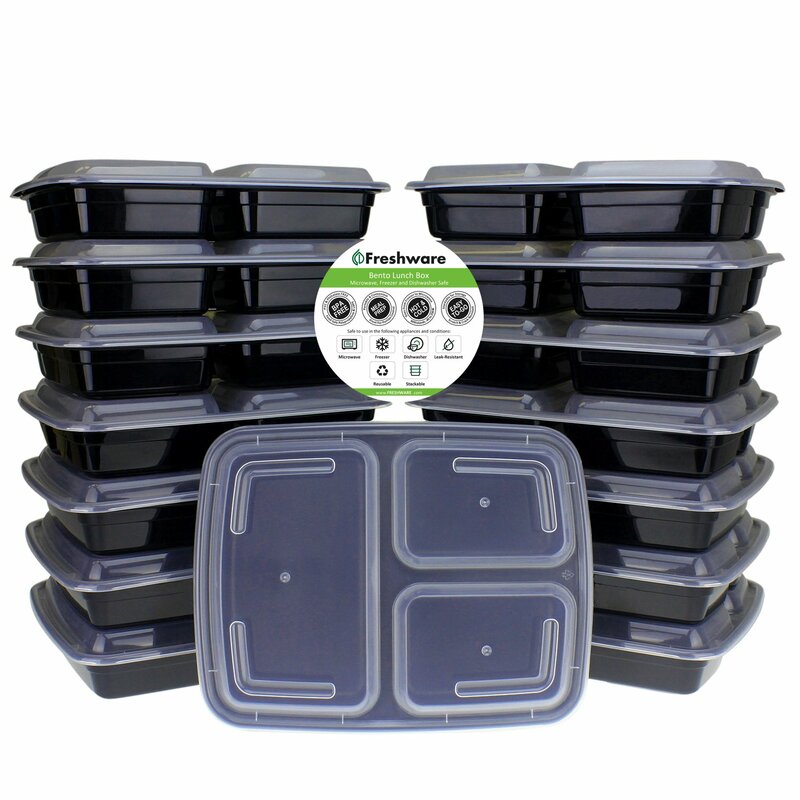 VERSATILE FOOD STORAGE CONTAINERS: The convenient dimensions (9.7 x 7.5 x 1.5") and the thoughtful division of this set makes these reusable plastic food prep containers great for a variety uses, including restaurant & deli takeout, bento box for work, foodsavers, and are recommended by fitness experts for meal prep, portion control, and 21 day fix. Trust a 5-Star Product and the LIFETIME Replacement or Refund policy of Freshware. Order Yours Today! STAY FIT & HEALTHY- Enjoy Delicious Nutritious Homemade Meals Everywhere With The 1 Meal Prep Containers By Freshware! Are you sick and tired of spending money on buying readymade unhealthy food? Meet The Ultimate Versatile Bento Boxes, Your New Best Friend In The Kitchen! With 3 spacious compartments of different sizes, you can use this set of 15smart lunch boxes for various snacks without them mixing all together. Yourmeal will look and taste good all day long! Provide yourself and your kids with a decent meal of controlled portions withmain course, salad and even dessert, all nicely packed in this superconvenient lunch box! Supreme Quality & Thoughtful Design Combined! Made exclusively of 100% food-safe, BPA, PVC and Phthalate free, FDA Approvedpolypropylene, these reusable launch boxes are the safest choice you can make. Thanks to their unmatched quality you can: Prepare more meals in advance and freeze them for the busy days when you won't have time to cook. Microwave them to enjoy a delicious hot meal. Clean them hassle free in the dishwasher! Box Size: 9.7 x 7.5 x 1.5 inch. Large Cavity Size: 6.8 x 4 x 1.5 inch. Two Small Cavity Size: 4.4 x 3 x 1.5 inch. Volume: 16, 8 and 8 oz, Total 32 oz. Lid Size: 9.8 x 7.5 x 0.6 inch. These Meal Prep/ Portion Control/ 21 Day Fix/ Food Storage Containers are agreat new alternative to expensive Tupperware. Perfect for kids lunch box,meal box for work while they are highly recommended by most fitness expertsfor meal preps, portion control, and 21 day fix. GET IT WITH CONFIDENCE: Freshware offers you their best free replacement or refund policy in any case! Your Purchase Is Risk Free. ADD TO CART TODAY!